Functional art - table lamp styled after Frank Lloyd Wright design. Shade is made of Sa Paper. Dimensions: 17 x 5 1/2 x 5 1/2 Weight: 3 lbs. You are looking at a very beautiful piece of functional art styled after Frank Lloyd Wright design. This table lamp is made of teak wood found in the dry northeast region of Thailand. It comes in your choice of either light teak wood or dark teak wood. The shade is made of Sa Paper which comes from the bark of the Sa tree. The process of making the paper is very involved as the bark has to be boiled then pounded with large wooden mallets against tree stumps until it becomes a smooth and flat mash. Then it is placed into large vats and stirred with long bamboo poles until flakes rise to the surface. These flakes are lifted out with wooden framed screens where the flakes settle and congeal while water runs through. Color has been added to the process by using silk flowers and greenery. Finally, the screens are placed in the sunlight to dry. The finished paper is then peeled by hand from the screens and placed in a pile to be used with the already hand crafted teak wood lamp. 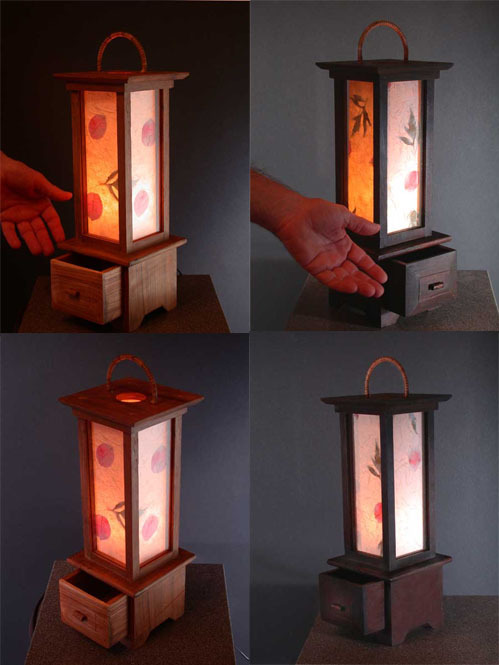 Each lamp is uniquely different. The light radiates a very warm glow using as much as a 40 watt light bulb.